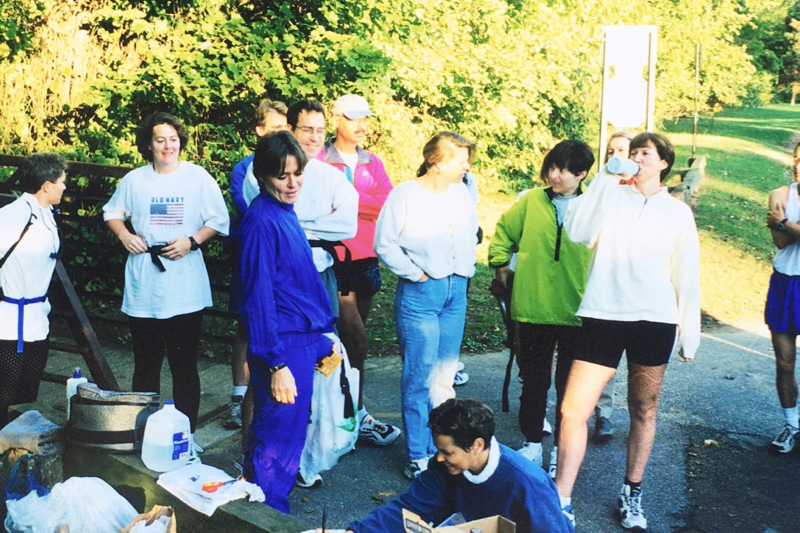 As a coach for the National AIDS Marathon Training Program in 1998, I trained my runners – the majority self proclaimed couch potatoes – to successfully run their first marathon at the end of their 26-week training cycle, all the while raising money to fund AIDS research and to bring an end to the AIDS epidemic. A friend from the gym where I worked told me that the newly founded National AIDS Marathon Training Program had openings for coaches. I’d just run my first marathon and ultra the previous fall and was in the midst of training for Boston; and decided I’d like to try marathon coaching and nervously threw my resume into the ring. The program founder, Richard Zychek, called me soon after receiving my resume and set up an interview. We had a pleasant interview and I was offered a job on the spot. There were still a few openings for coaches so I had a choice of a couple of different locations throughout the DC area. I would have preferred to meet my runners on Saturday morning, but the location in Chevy Chase, Maryland at Candy Cane Park would be the shortest commute and I snagged it. Even so, it would be an hour drive every Sunday morning to meet my runners at 7 AM. 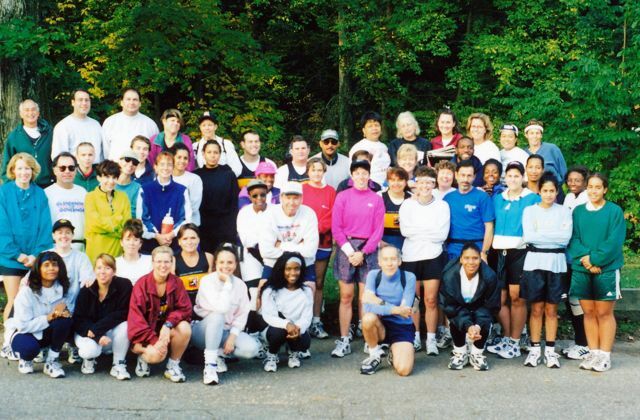 1998 was the inaugural year for Walk-The-Talk Production’s National AIDS Marathon Training Program. 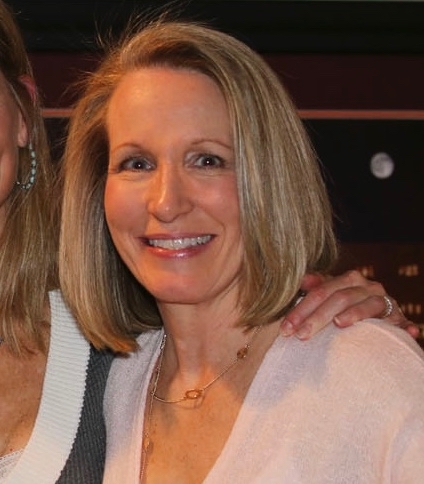 There were five coaches throughout the DC area – one in Maryland, one in Virginia (that location was already staffed when I got the job), and three in DC. During that first year, all participants would be training for the Marine Corps Marathon, and fundraising proceeds would stay local with Whitman-Walker Clinic in DC. 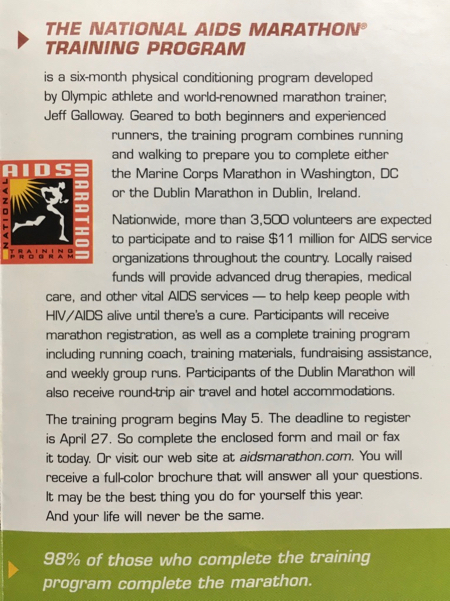 During subsequent years, in addition to DC, there were National AIDS Marathon Training Programs set up in Chicago, Los Angeles, and San Francisco. As the program expanded, runners were able to fundraise for AIDS while training for the Marine Corps Marathon, Dublin Marathon, Honolulu Marathon, Mayor’s Midnight Sun Marathon in Anchorage, and the San Francisco Marathon. When half marathons were available, runners had the option to train for them instead of the full marathon. If the runner met the fundraising quota for that particular marathon, they gained an entry into the race. 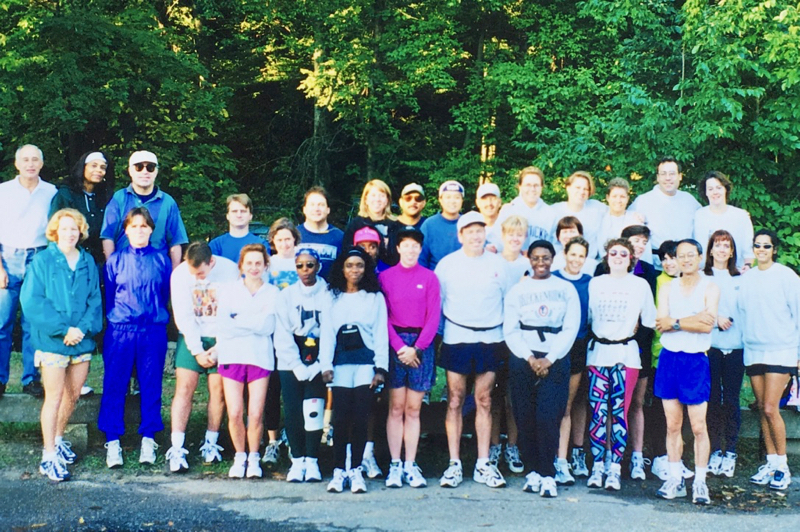 From its beginnings in DC with only five coaches and runners raising money to support the local Whitman-Walker Clinic, the program grew and fund raising efforts of runners across the country helped provide advanced drug therapies and critical medical treatment to those suffering from HIV/AIDS in their home cities. 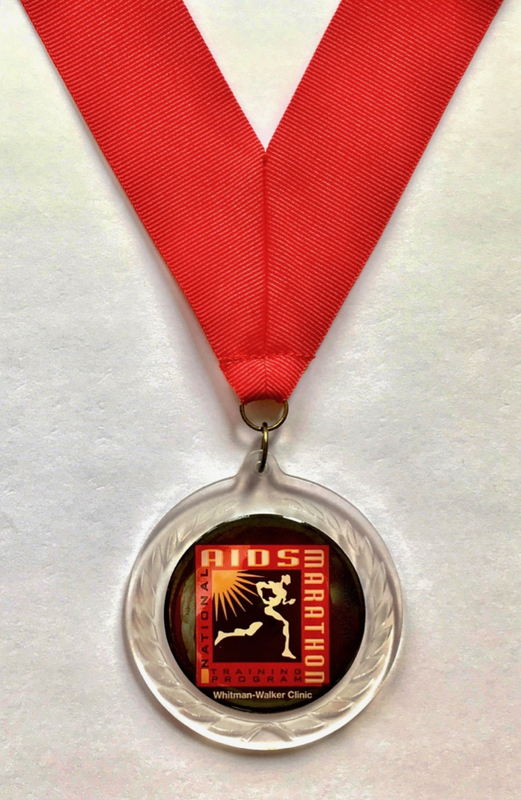 During the nine years the program was held, over 17,000 runners participated and raised $65 million for AIDS. The other coaches and I were introduced to Jeff Galloway when he came to DC to train us to coach using the Galloway Run Walk Run Training Program, the training plan we would be following with our runners. Jeff developed his training program in 1976 after realizing that the runners in his new group were ill prepared to run a 5K or 10K without injury. Inserting walk breaks into their training runs allowed his runners to conserve energy and periodically rest their running muscles, resulting in a quicker recovery and a more successful race. On April 26, 1998 I met my group of around 100 runners at Candy Cane Park for the first time. Before they arrived, I set up a one mile out-and-back route on the trail that would become very familiar to all of us over the following 24 weeks (week 26 would be race day). My brand new friends, who I would get to know pretty well over our 26-week training program, were to run, run/walk, or walk the one-mile distance to help determine which pace group they would fall into. Each pace group was named after a famous runner and we had signs printed with those famous runners’ names for runners to gather behind after they crossed the finish line as I shouted out their time. Each pace group chose a captain who would be responsible for making sure the group stayed on the right pace and run/walk intervals. Each Sunday we met at Candy Cane Playground and ran either north or south along Rock Creek Trail. 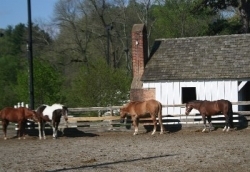 A highlight of our run when we headed north was seeing horses at Meadowside Stables. Heading south put us on Beach Drive which was closed to traffic on the weekends and provided a scenic run toward DC. Following that trail would have eventually taken us past the monkeys at the National Zoo; however, we needed to turn before that point to get back to the play ground. Years later, running Marathon in the Parks and the Parks Half Marathon always brought a smile to my face as I ran along these very familiar trails which became my home away from home during my training that summer. 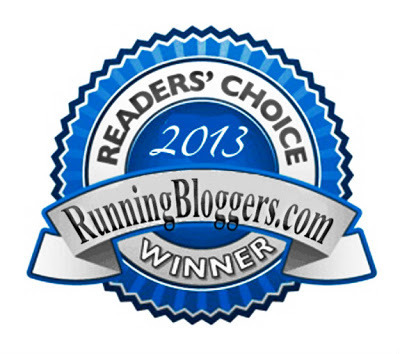 As the summer progressed, there was a core group of runners who rarely missed our Sunday long run. I got to know some of the runners better than others, but enjoyed my time with everyone. Most weeks I started running with the slowest group, ran with them for a while, sped up to catch the next group, ran with them, and so on until I caught the fastest group, sometimes already after the turnaround. I could have ridden a bike, but preferred getting to know my runners the best way possible, while running side-by-side with them. This type of training – doing pickups during my long runs – kept me in amazing shape! Runners were supplied water refills along the course each week. Bill’s and my garage looked like we were preparing for Y2K a little early with our garage filled with gallons upon gallons of water jugs after a truck dropped off a 26-week supply for 100 runners’ long runs. Each Sunday I’d take enough gallons for that day, and volunteers – usually friends and family of the participants – would set up water stations along where we would be running. 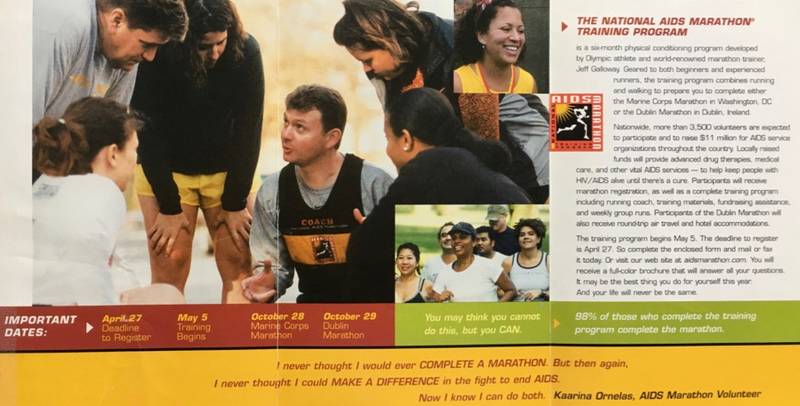 In addition to guidance in setting up their fundraising campaigns, each participant also received a National AIDS Marathon Training Program shirt (a black and yellow tank) which can be seen on three of the runners in the following picture. For our last long run of the training cycle, all of the participants of the program gathered in Virginia along the Potomac River to run their unofficial marathon. Jeff’s program takes runners the full marathon distance so there are no surprises on race day and no question that runners can go the distance. A couple of the other coaches had set up a course and handed out maps so we knew where to run. Roads were open so we had to be careful of traffic when we came upon streets. As each runner crossed the finish line, they received a medal with our training program logo on the front. 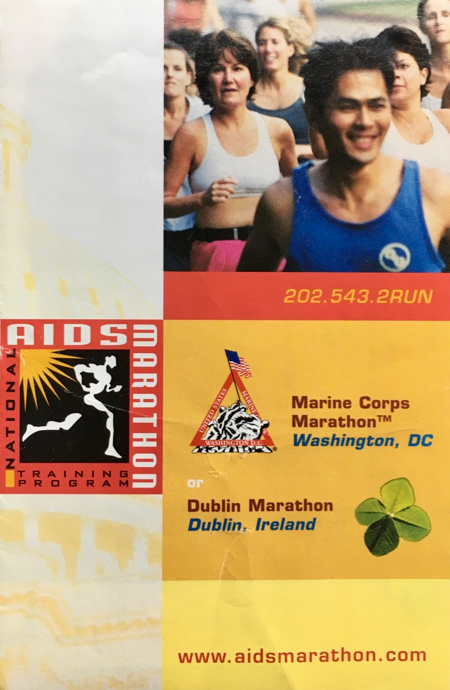 With fundraising obligations met in exchange for entrance into the 1998 Marine Corps Marathon, race day arrived and a special tent was set up for all National AIDS Marathon Training Program participants to use as home base before and after the race. Fruit and water was on hand and of course the coaches were there to help calm the nerves of our runners. 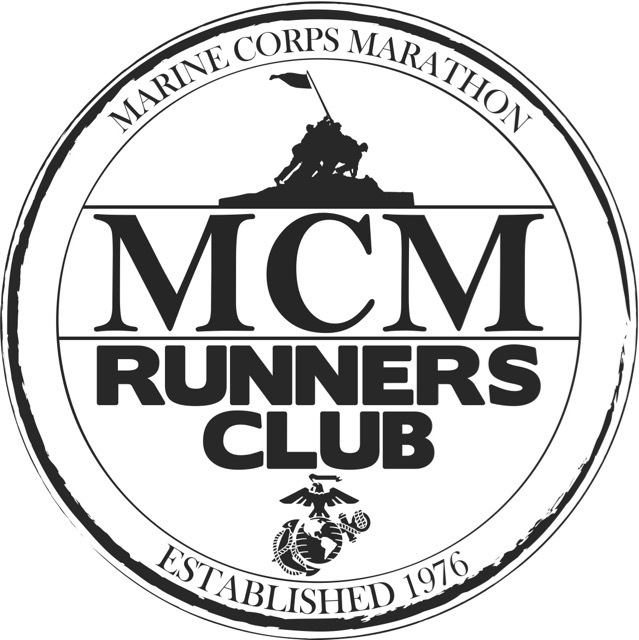 I was registered to run the Marine Corps Marathon as well, and finished my race in 3:46:54. 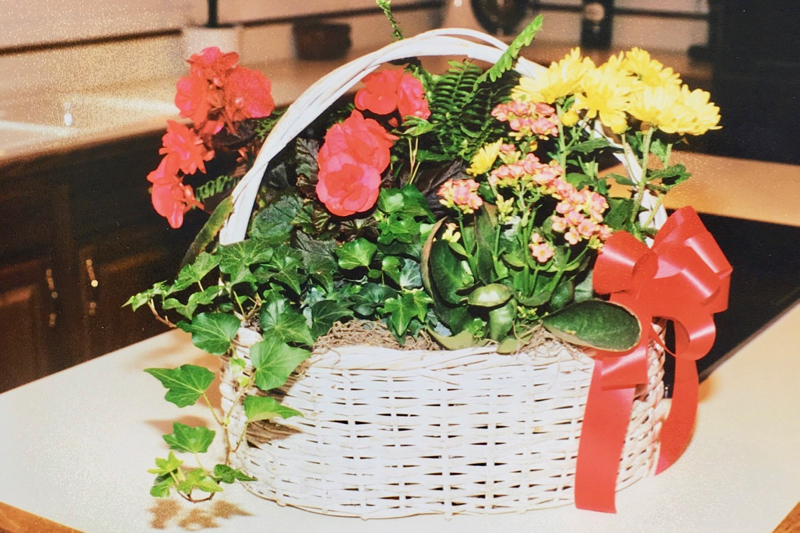 Bill and our sons were on hand to cheer me in, and after we visited for a while, they had to leave for a soccer game. I headed back to the bottom of the hill to the access road to the Marine Corps War Memorial and waited for my runners. As each of my runners approached, depending on what level of encouragement they needed, I’d either cheer wildly or jump back on the course and run with them partially up the hill toward the Iwo Jima Memorial until I needed to duck off the course to avoid the finish line chute. I ran up that hill countless times with my runners and wish there’d been such a thing as a Garmin or Fitbit (affiliate links) back then to track my distance! I stayed until my final runner came in, one of the very last, if not the last, runner to finish. She collapsed and was taken to a medical tent where she was given fluids in an IV. Marines called her husband and insisted I go home. I was comfortable doing so knowing that she was in good hands with the Marines. A few weeks after the Marine Corps Marathon (MCM), Mary, one of my new running friends, graciously opened her home up for our post-race celebration. Not only had my group of runners raised money for AIDS research, but every runner who began the MCM, finished, and we needed to celebrate! I brought a special cake I’d had made with a replica of the logo on the top, but sadly, I can’t find the picture Mary took and later sent to me. As a thank you, my runners presented me with this poster that they all had signed on the back, these flowers, and a very generous gift card to Dave & Buster’s. 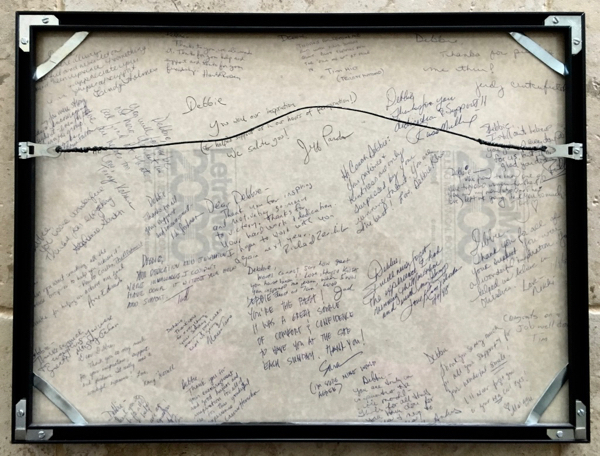 For several years after the 1998 National AIDS Training Program I continued to see some of my new runner friends at DC and Maryland races, but since I don’t run in that area very often, I haven’t seen any of them in several years. I have looked for some of them (whose last names I remember) on Facebook, but without any luck. If you happen to be reading this and you ran in my group, please reach out in the comments below, I’d love to know how you’re doing! The following year I was asked to return, but decided the commute and time away from my family on Sunday mornings for 26 weeks was too much at the time. I did; however, return to coaching two years later for Worldgate Sport & Health, the gym where I was currently training clients. My experience with the National AIDS Marathon Training Program was very enjoyable and I learned so much. It was a fantastic stepping stone for my subsequent coaching career. If the program were available today, I would highly recommend any aspiring marathon runner take part! Have your trained for a marathon or half using one of the fund raising training programs? If so, which program and for which race did you train? Have you ever coached – running or any other sports and what ages? I love your throwback posts! What an awesome experience. Thanks so much, Kim! It was a great stepping stone to my many years of coaching for Worldgate. 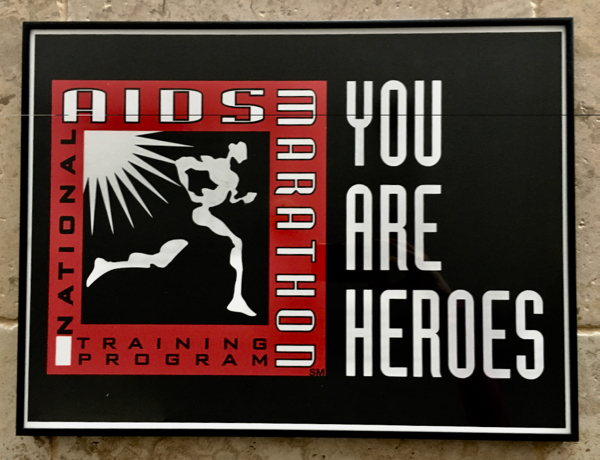 Do you know if this program – AIDS Marathon Training Program is still in existence? I don’t believe it’s still in existence. I tried to find current information about it, but with no luck.